Giuseppe Arcimboldo (Born in 1527) was born in Milan. He was born to Biagio who was a painter who did work in the Duomo for the office of the Fabbrica. In 1556 he worked on frescoes for the Monza’s Cathedral with Giuseppe Meda. And in 1558, he drew the cartoon for a large tapestry of the Dormition of the Virgin Mary. In 1562 Arcimboldo became court portraitist at the Habsburg court in Vienna to Ferdinand I, and later at the court in Prague to Maximilian II and his son Rudolf II. He was also costume designer and the court decorator. King Augustus of Saxony saw Arcimboldo's work when he visited Vienna in 1570 and 1573, and commissioned a copy of his "The Four Seasons" incorporating his own monarchic symbols. Unfortunately, his conventional work on traditional religious subjects has fallen into oblivion. However, his portraits of human heads made up of tree roots, vegetables and fruit remain a source of fascination today and were greatly admired by his contemporaries. Many critics have not agreed on whether these paintings were the product of a deranged mind or were whimsical. Many scholars hold to the view that the artist served the taste of his times given the Renaissance fascination with the bizarre, puzzles, and riddles. 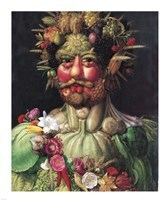 Arcimboldo died in Milan. His Italian contemporaries honored him with manuscripts and poetry celebrating his illustrious career. His works can be found in numerous collections around the world. They are also found in many museums in Sweden and abroad.